There are LTCs that have "pets" or therapy animals incorporated into their programs and milieu, so obviously animals are not prohibited from LTC settings across the board. But those situations are part of a planned therapeutic program. It sounds like you're talking about something entirely different, people just bringing their pets to work with them, and not for the benefit of the residents. Have you talked to these nurses about what they're doing, and have you talked to their superiors about your concerns? 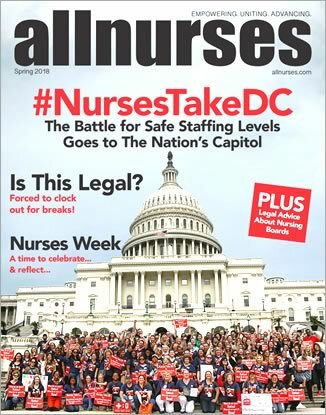 You say that other nurses there are also unhappy about the situation -- I would caution you to address this as a group, and not to be the only person who is questioning the situation, lest you end up being targeted for having complained. Also pets brought in for Pet Therapy need proof of current immunizations avail on record. So if there's any chance of contact with residents that could be a problem. And as long as the monkeys aren't pooping/peeing/spitting etc there may not be any sanitary issues. You comment the nurses are in management, so I'd proceed very slowly. Their job is different than yours unless you all have the same job title, so their job responsibilities may differ from yours and some of your coworkers. I know the monkey fear; I have a dog phobia. However nobody ever seems to honor a "fear of ...". They will honor it if you have an "allergy to". This might be a means with which to avoid exposing you to the monkeys. But you'll need documentation. So SANITARY, FAIR and LEGAL - maybe, maybe and maybe. I agree with the above. Since your coworkers are just playing with their pets and not doing their work, the company would probably take issue. I'm an upfront guy, so I would definitely talk to them about it first before going to HR. If they snub you or escalate things/retaliate by bringing the monkeys near you on purpose, I would ask them to stop in front of a witness, then go to management if they do not. We never had any monkeys when I worked LTC, but a CNA brought in a miniature horse once. The residents loved it. So, while I thought it was a bit odd, I just petted it, washed my hands, and went back to Med pass. But I did wonder what would happen if it crapped on the floor. I worked with a LTC nurse who brought in her pet dog as part of a Therapy program. She arranged it with Admin and Recreation. That dog was the most well-behaved dog I ever met. Nurse just did her job but brought the dog along with her on her rounds. Her residents LOVED it. She would take the dog outside for quick breaks and the whole thing worked out so well. I was always aware of the dog' presence, but I even liked that dog!!!!!! Not in ours. I handle Infection Prevention. I also handle the pet records. Our state has a policy of what animals are allowed. Monkeys are considered "exotic" pets. We don't allow those at all. Check your state policy. In addition, our visiting animals are only allowed in certain areas and they must show written current proof of vaccinations and a signed letter from the owners' veterinarian, on their clinic letterhead. We keep a roster of what pets have been cleared at the desk in reception. If that animal is not on the list, it is not admitted to the facility. These animals also have to be trained, housebroken, and at least 6 months old, and able to handle loud noises, children, other animals close by, etc. They must be on leash at all times and not in the control of any child. They also cannot interfere with staff or Residents who are ambulating, etc. They cannot bark incessantly or whine. We are very strict. We have to be.